Vera Kholodnaya. Russian postcard, no. 88. Collection: Didier Hanson. Vera Kholodnaya. Russian postcard, no. 131, 1914. Collection: Didier Hanson. 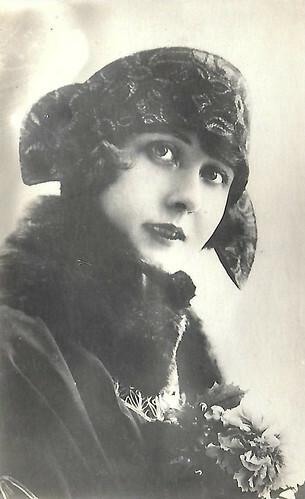 Vera Kholodnaya. Russian postcard, no. 135. Collection: Didier Hanson. 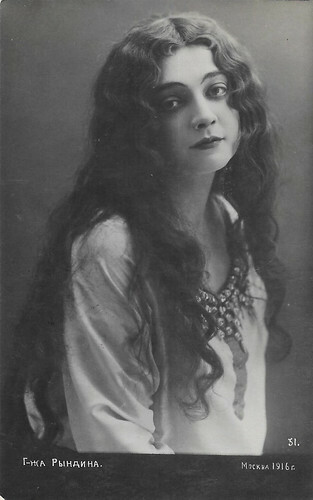 Vera Kholodnaya (1893-1919) was the first star of the Russian silent cinema. Only 26, the ‘Queen of Screen’ died of the Spanish flu during the pandemic of 1919. Although she worked only three years for the cinema, she must have made some forty short and feature films. 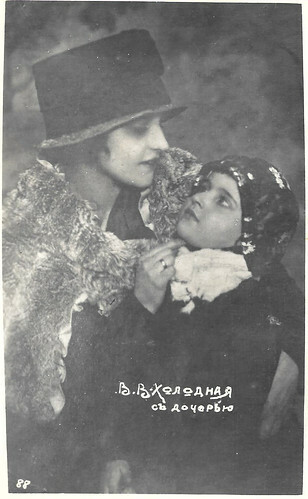 The Soviet authorities ordered to destroy many of the Kholodnaya features in 1924, and only five of her films still exist. 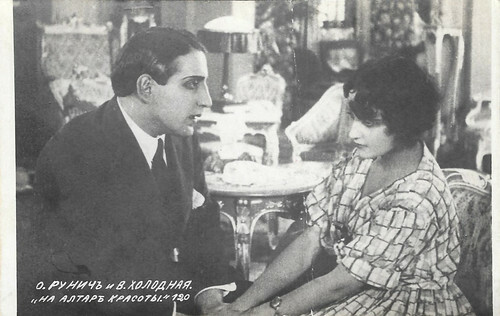 Ossip Runitsch and Vera Kholodnaya in Na altar krasoty (1917). Russian postcard, no. 120. Photo: publicity still for Na altar krasoty/To the Altar of Beauty (Pyotr Chardynin, 1917). Collection: Didier Hanson. 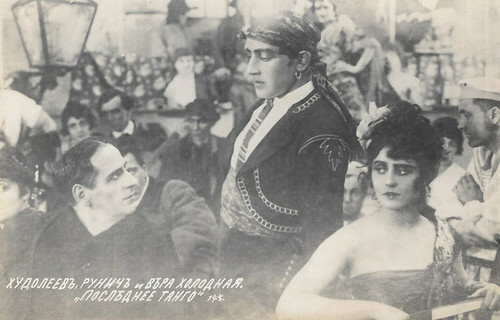 Ivan Khudoleyev, Ossip Runitsch and Vera Kholodnaya in Posledneiye tango (1918). Russian postcard, no. 145. Photo: publicity still for Posledneiye tango/Last Tango (Vyacheslav Viskovsky, 1918). Collection: Didier Hanson. 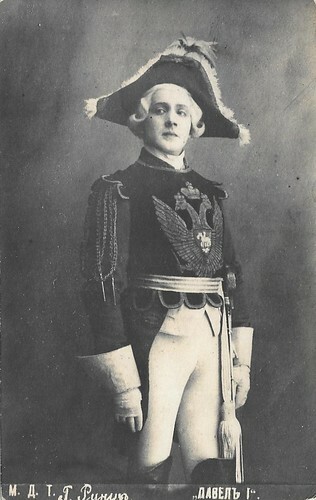 Ossip Runitsch. Russian postcard, no. 100. Collection: Didier Hanson. Ossip Runitsch. Russian postcard. Collection: Didier Hanson. 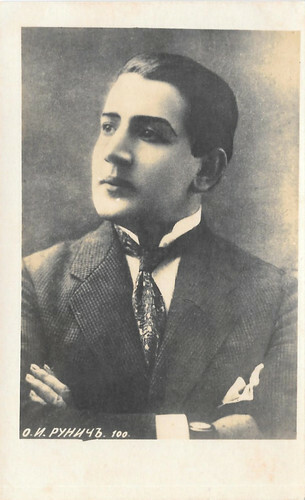 Russian actor, producer and stage director Ossip Runitsch (1889-1947) was one of the biggest stars of the Russian silent film and one of the first iconic figures of the early Russian cinema. After the October revolution, he worked in Latvia, Italy, Germany, France and South-Africa. 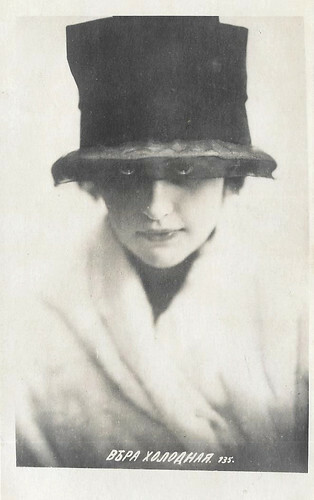 Lidiya Ryndina, 1916. Russian Postcard. Collection: Didier Hanson. 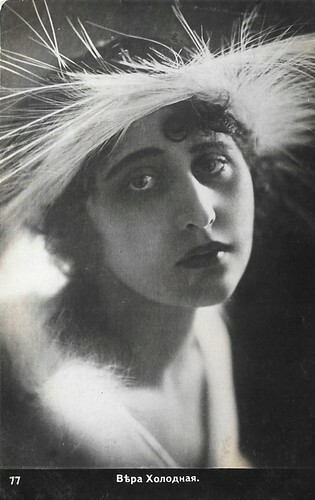 Vera Karalli, 1917. Russian postcard. Collection: Didier Hanson. 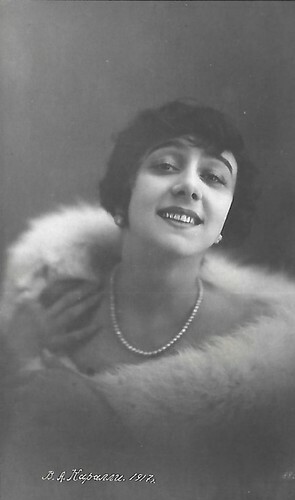 Vera Kholodnaya. Russian postcard, no. 77. Collection: Didier Hanson.